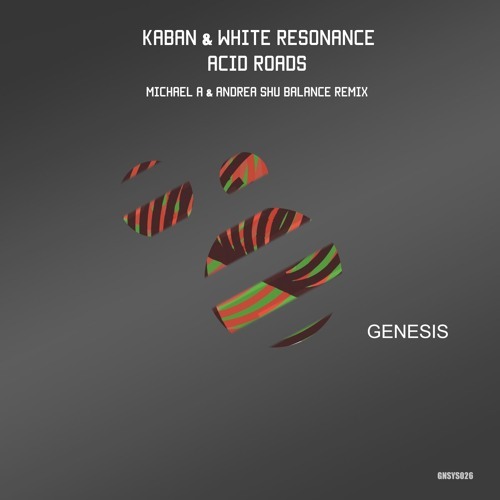 The latest release on Michael A’s Genesis Music finds Kaban and White Resonance collaborating on a new single entitled ‘Acid Roads’. Hailing from Mexico the duo have worked together in the past with a release on Clinique Recordings in August of 2014. Now after nearly two years of successful solo projects for Superordinate Music, System Recordings and PHW Elements we see the duo presenting a new single for Genesis Music alongside a remix from Michael A and Andrea Shu. Both Kaban and White Resonance have excelled in their solo projects so their creative fusion after nearly two years apart is certainly an exciting prospect. ‘Acid Roads’ does not disappoint with its percussive flair and swing heavy groove. Ominous bass tones make for a distinctive theme early while drum fills, sweeping noise and a glooming backdrop further the otherworldly atmosphere into the main break. Calculated and deadly, the tracks centrepiece goes quiet with a solemn tension before the drums crash down and reignite the groove for an acid fuelled finale. Groovy stuff from Kaban and White Resonance. The lone interpretation of ‘Acid Roads’ is provided Michael A and Andrea Shu. The Genesis Music boss and fellow Belarus artist have collaborated before with Dmitry Molosh on ‘Boomerang’ released in April of 2015 on Dave Shtorn’s Magic Room imprint. Over the last year Andrea has become known in the progressive underground thanks to four releases on Genesis Music and one on Balkan Connection. Here Michael and Andrea have given ‘Acid Roads’ a more energetic feel with a driving groove and galloping rhythms. The hypnotic appeal is immense and those subtle acid hooks play a huge role in that. It’s smooth melodic sensibility takes the edge off the original and the main break is absolutely gorgeous with its soft tonal themes and wispy atmospheres. Beautiful remix from Michael and Andrea which rounds out another excellent offering from Genesis Music. Don’t miss it.